For those of us who have an aversion to blood, gore and open wounds, the action of Christ displaying His more-than-just superficial scars would indeed be disturbing. Why would He choose to do so? The answer is actually quite simple. It was to establish his identity, that He was the very same Jesus whom they had followed, whom at last they had deserted, whom they had beheld afar off crucified and slain, and whom they had carried to the tomb in the gloom of the evening; it was the very same Christ who was now before them, and they might know it, for there was the seal of his sufferings upon Him. The same Christ who died on the cross is the same Christ now truly risen. He was the same person. He was not a phantom or a spectra. It was truly Christ’s same body but it was also a glorified body: He could appear and disappear at will, walk through closed doors, be somewhere at one moment and elsewhere the next. Christ wears these scars in His body in heaven not as evidence of His failure but as His ornaments. The wounds of Christ are His glories, they are His jewels and His precious things. Nor are these wounds only the ornaments of Christ: they are His trophies—the trophies of His love. Have you never seen a soldier with a gash across his forehead or in his cheek? Why every battle-scarred soldier will tell you that the wound in battle is no disfigurement—it is his honour. Now, Jesus Christ has scars of honour in His flesh but He has other trophies. He has divided the spoil with us, the Church: He has taken the captive away from our ancient enemies, Death and the Devil; He has redeemed for himself a host that no man can number. We are all the trophies of His victories: but these scars, these are the memorials of the fight, too. Likewise, as Christ shows us that wearing these wounds of suffering is an honourable thing, to suffer for Him is glory. The Christian religion teaches us that it is not humiliation but glorious to be trodden, to be crushed, to suffer for our faith. The highest honour that God can confer upon His children is the blood-red crown of martyrdom. Just like photographs, certificates and trophies which serve as reminders, the wounds of Christ too serve to remind us of the price that was paid for our freedom. They are reminders of the extent of God’s love. If the wounds had been removed we might have forgotten that there was a sacrifice; and, mayhap, next we might have forgotten that there was a priest. But the wounds are there: then there is a sacrifice, and there is a priest also, for He who is wounded is both Himself, the sacrifice and the priest. There is another terrifying reason why Christ wears His wounds still. It is this. Christ is coming to judge the world. As the whole of humanity, every generation in every age, are arraigned before Him, His own wounds are His witnesses and proof of our guilt. “Habeas corpus.” “Show us the body.” But this is no dead corpse of a pitiable victim of injustice. This is a body of the first born from the dead, once truly dead but now risen. This is the body of the one who will judge “the living and the dead.” At the Last Judgment our Lord displays these wounds so that it might be apparent to all, even to the damned, how just their condemnation really is, in that they spurned so great a redemption. A crucified Christ with His wounds still open will be a terrible sight for an assembled universe because His death was wrought by the hand of mankind, of all and entire humanity, present company included. Others did it for you, and though you gave no consent verbally, yet you do assent in your heart every day. As long as you hate Christ and everything which is holy you give an assent to His death. As long as you reject His sacrifice, and despise His love, you give evidence in your hearts that you would have crucified the Lord of glory had you been there. As long as you desire to usurp the authority of God, you hammer another nail into His hands and feet. As long as you hate and mistreat your neighbour, you crucify Him afresh and put Him to an open shame. But there may be another reason why our Lord sports His wounds. It is the Incarnation, “the becoming flesh”, the divine condescension which allows God, the Second Person of the Most Holy Trinity to enter into our frail, fractured and broken human condition. In becoming one of us, our Lord understands that He cannot be immune from the scars and wounds we bear in our daily lives. Christ in showing us His wounds also means for us to learn that suffering is absolutely necessary. We all suffer wounds of one sort or another, some physical, some mental, some spiritual. Some are self-inflicted; some are not. Some of us carry them with us through life. The vulnerability of Christ’s wounded flesh confirms that it is indeed human flesh, just like all human flesh which is prone to suffer injuries. At the same time, the dreadful paradox of that which reminds us of His humanity, is also a revelation of His divinity. Witness the reaction of St Thomas at the moment when Jesus invites him to touch His wounds. 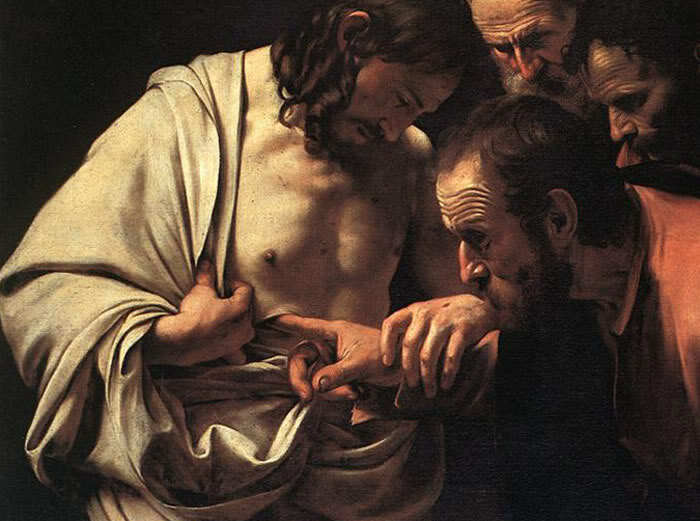 We hear the most profound confession of faith: “My Lord and my God!” The wounds offer sight – a sight which may be hidden from our physical eyes. As a result of our Lord’s offer, Thomas moves from doubt to belief: from question mark to exclamation mark. Today, as we contemplate the great mercy of our Divine Lord, we come to realise this impossibly consoling truth: poor, weak, and wounded though I am, He has not and will not discard me. His wounds are healed wounds, note that they are not running sores; and so, though we be the wounded parts of Christ, we shall be healed; though we shall seem to ourselves in looking back upon what we were, as only parts of a wounded body, still we shall rejoice that He has healed those wounds, and that He has not cast us away. Precious truth! The whole Body, His Body, He will present before His Father’s face, and wounded though He be, He shall not cast His own wounds away. Let us take comfort, then, in this; let us rejoice therein. We shall be presented at last, without spot or wrinkle, or any such thing. Christ's wounds are no spots to Him, no wrinkles, but they are ornaments; and even those parts of His church on earth that despair of themselves, thinking themselves to be as wounds shall be no spots, no wrinkles in the complete and perfect Church above, the new and eternal Jerusalem, which receives its light directly from the glory of Christ.